Every workplace needs a boss, and ours is no different. It’s all very well having a team of the best, most trench-hardened archaeologists that money can buy, but the excavation will never progress without someone with the will and authority to make the big calls and the tough decisions; to fight for the site and whip the staff into shape; someone to eventually revel in the glory of victory or the carry the responsibility of failure at the end of this excavation. That person is the Project Officer (well, there is the Project Manager as well, but this blog is about the staff on site, and you very rarely see them digging!). Put simply, Project Officers run excavations, coordinating both the archaeological and logistical sides of the operation. 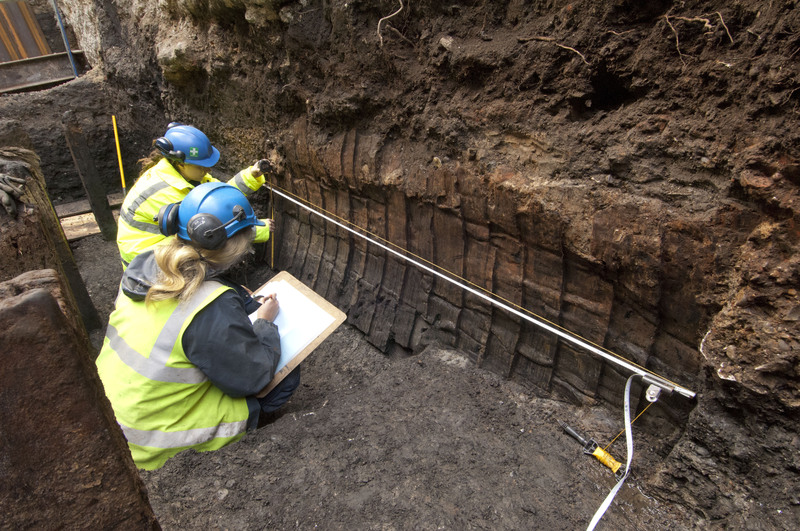 This means everything from contacting finds specialists and working with project managers and local authorities to plan excavation strategies, to managing staff and equipment levels. When things quieten down, you may even see one picking up a trowel. As the most senior MOLA representative on site, the Project Officer is also the face and voice of the excavation, giving tours to the public and representing MOLA at meetings with the contractors and developers. Most importantly, the PO is the only person who will be with a project from start to finish, steering it through planning, excavation and analysis all the way through to publication. Our Project Officer is Sadie Watson, who can often be seen dressed in a sharp business suit, presiding benevolently over affairs from her gilded throne at the side of the trench. Just kidding – Sadie says that one of her favourite things about this job is the lack of hierarchy, as everyone is crucial to the progress of the dig and anyone could make the next big find. That, and she hates wearing a suit. Over the course of the project, Sadie will spend most of her time at the office, but as long as we’re still digging she’s on site every day, monitoring progress and writing reports. Compare this to the role fulfilled by W.F. Grimes 60 years ago, and there is a stark contrast (Grimes only came infrequently on to site to draw sections. Although we do have a section in a particularly wet hole that needs drawing…). The only qualification you need for this role is experience, and Sadie certainly has that. A professional archaeologist for 18 years, Sadie has spent 15 of them with MOLA and has been a Project Officer for the last 5. And whilst most of us are on this site for the money and prestige, Sadie is here for the archaeology, using this site as the basis for her PhD. 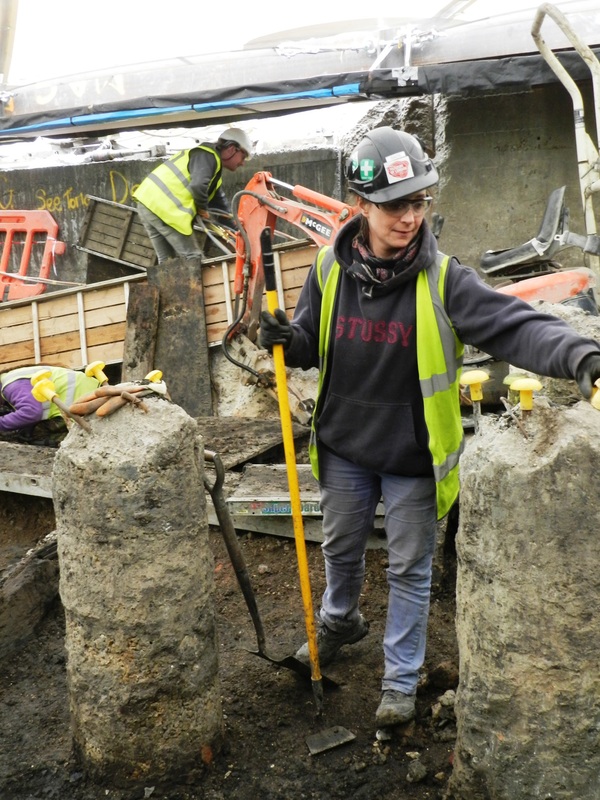 You may be thinking that this sounds like a pretty sweet gig, getting to work on the biggest excavation in London’s history without getting dirty, but it’s not all good. The high levels of stress, constant pressure and having to make tough decisions based on budget as much as archaeology mean that many archaeologists choose to stay in the trench rather than progress into positions like this. How does Sadie cope with it? As with many of us, the thrill of looking into the unknown is too much to resist, and only from this lofty position do you really get to see how our work contributes to the true history of London (those of us on the ground only find out what was here when the report gets published!). It’s also a great way to combine mental and physical exercise (without doing too much of the latter). And, of course, she loves the people she works with, the ‘bunch of sad geeks’, as she puts it. And we’ll be hearing more about those sad geeks next time!